Jewelry can reveal a person’s truth; their personality and even a bit of their journey. Jewelry can be more than a superficial style. 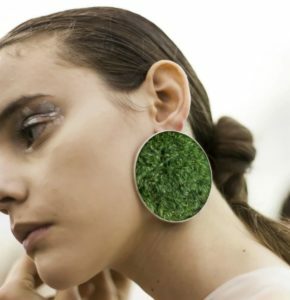 For a one-of-a-kind piece of jewelry that is sure to draw attention and resonate with people on a deep level, Argentine-born artist Isabel Englebert and Plant the Future preserved moss collab offer the perfect combination of jewelry, art and a path on the journey to health. The two inspirational women have come together to create a 15-piece collection suitable both as prêt-à-porter everyday wear as well as bold statement pieces for a night out on the town. Wear your jewelry as an extension of your soul. Jewelry should help you express your true self in small ways as a cuff bracelet or a statement teardrop necklace. In whichever way you decide to express your style, make an effort to go out of your comfort zone and say “yes” to accessories that emphasize nature. 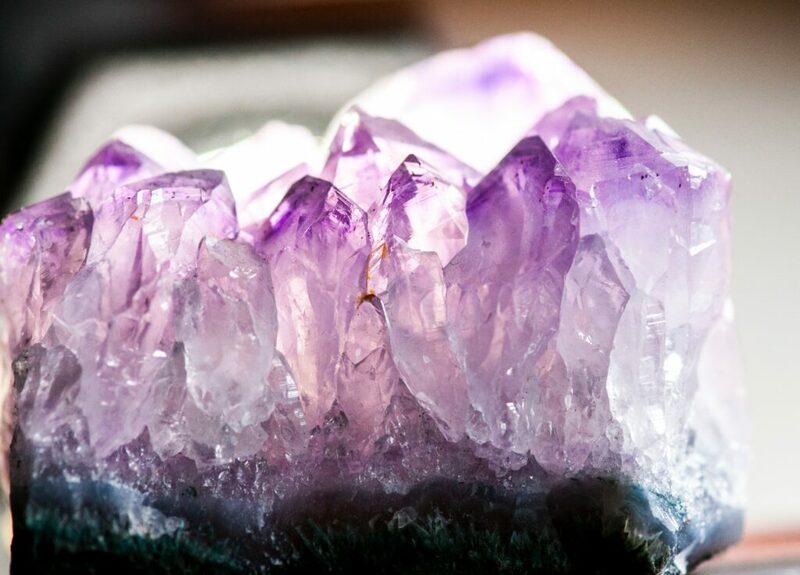 Sacred geometry is all around us and these geometric patterns are believed to hold the energy of the universe. These silver moss geometry earrings will connect you with your natural world using the sacred geometry of a pentagon to draw the universal energy into your soul. Awaken that spirit within as the energy of the world ignites itself in you. Circles often symbolize the unity and harmony of the mind, body, and soul. This said, the silver moss circle earrings inherently bring this symbol to life. The wholeness of the circular shape with the contrast of the silver brings together the yin and yang of the modern world – our need for natural beauty in an industrial city of strength. As fashion week approaches and you are slowly putting together all of the outfits to wear as you glean Haute designer garments, keep in mind the details that pull together look. An outfit may be beautiful, but accessories can make it come to life or swing it in a completely different direction. 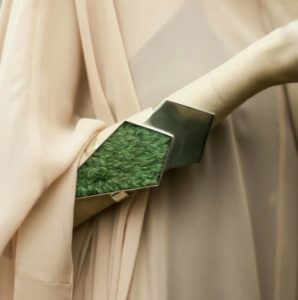 The moss geometry pair cuff is simple, yet perfect for any high-brow event such as New York Fashion Week. Rock this geometric pair cuff with confidence that it will not get ruined as our preserved moss needs no maintenance at all. Simplicity is important to our nature of being because it allows us to find and develop the ability to control our thought. This is by providing the human psyche conditions conducive to a life of meditation and spiritual being. The beautiful moss triptych necklace rests on your chest as a constant physical and visual channel for the needed simplicity to flow through you. 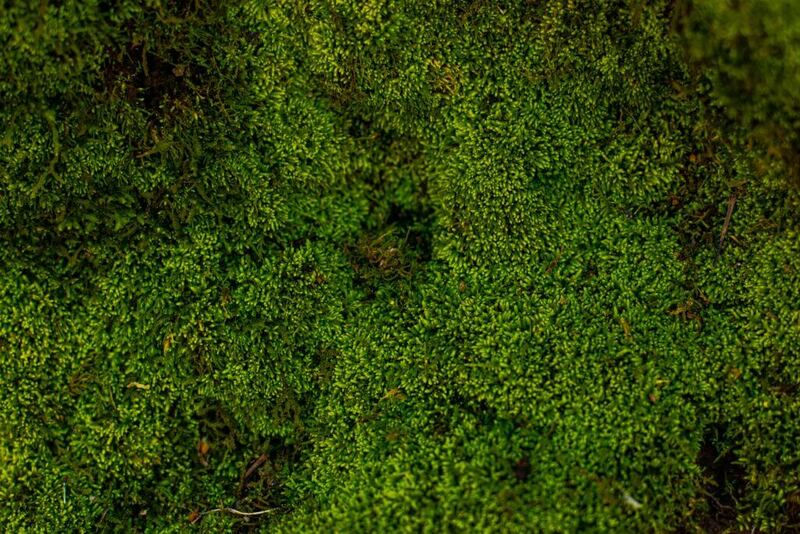 The preserved moss combination with the metal represents the pure equilibrium of the spirit and outside world. 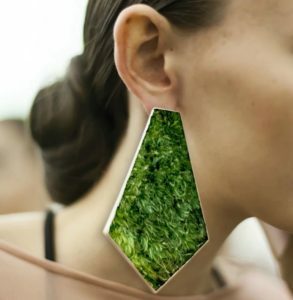 Shopping For a Whole Moss Jewelry Set? 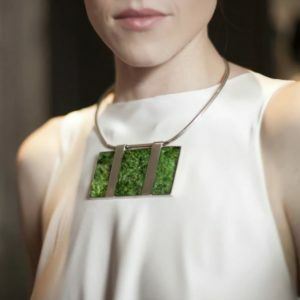 The preserved moss collaboration with jewelry designer Isabel Englebert includes pieces to fill an entire jewelry set for a unique you that lights up any room. Browse the whole collection online to mix and match pieces. 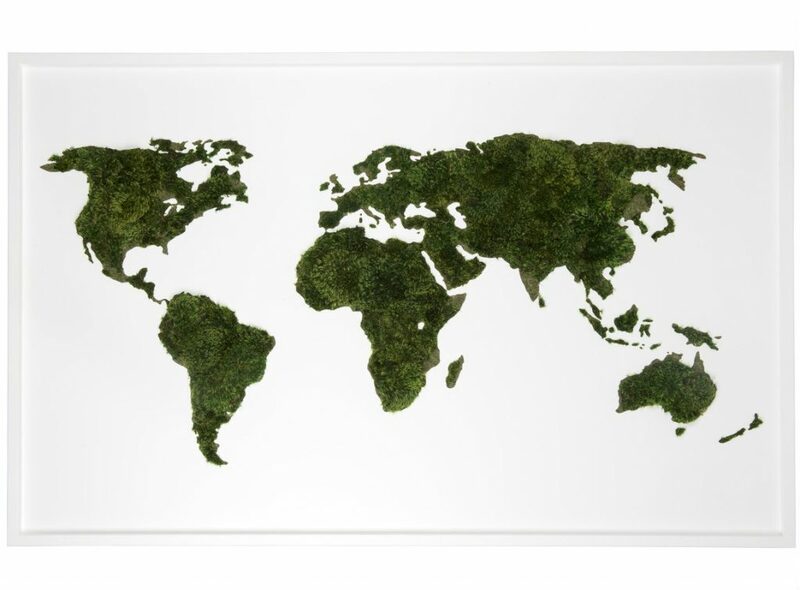 If you are interested in the other work Plant the Future does with preserved moss, submit the contact us form online to chat. We are always happy to guide you in the development of your jewelry and especially of your home at our Wynwood (Miami, Florida) location or HQ.